Dale Chihuly's Ruby Red Icicle Chandelier is the signature piece for the newly opened Chihuly Collection in St Petersburg, Florida © 2010 Karen Rubin/news-photos-features.com. The opening of the Chihuly Collection further cements St. Petersburg, Florida’s position as a Top Arts Destination. There are only 20 museums in the world dedicated to a single artist, and St. Pete already has one of them: the Salvador Dali Museum. 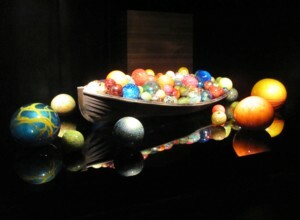 Now, with the opening of the Chihuly Collection, it has the 21st. Dale Chihuly – the Louis Comfort Tiffany of our time – is a pioneer, a visionary, and a master of glass-making, the student of the legendary Murano glass works in Venice who returned as a teacher. The variety of techniques, the use of color and texture and shape, are marvelous to behold and are fabulously displayed here. Glass making goes back 5,000 years, and glass-blowing 3,000 years. 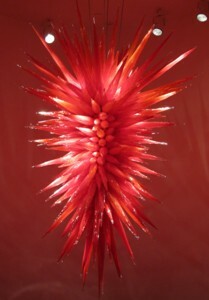 Chihuly takes the art to new frontiers. 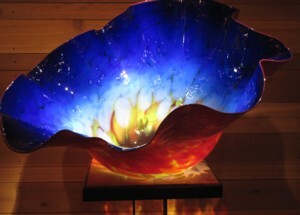 The Chihuly Collection is presented by Morean Arts Center, an arts-education institution, where there is a glass studio and hotshop that can also be visited (separately, as well as with a combination ticket). Make time to see a DVD about Dale Chihuly which is more about the creative process than a straight-forward biography – and follows the development of four major installations around the world: Ireland, Jerusalem, Venice. The whole film takes about 90 minutes, but you can visit at any point and pick up the story. But here is where you get a much fuller appreciation for how he incorporates the culture and texture of different places. Chihuly got the idea for "Float Boat" - a boat filled with glass-blown balls and objects after his "River of Glass" project, when kids picked the glass objects out of the river and put them into their boat © 2010 Karen Rubin/news-photos-features.com. Then you follow some 16 different major works – each one made up of as many as hundreds of separate pieces – so there are some 4,000 pieces in all. The Collection – the basis is $6 million in acquisitions by Beth Ann Morean – includes Chihuly’s spectacular large-scale installations such as Ruby Red Icicle Chandelier, created specifically for the Collection, as well as several popular series works including Macchia, Ikebana, Niijima Floats, Persians and Tumbleweeds, which have been exhibited around the globe. Each space has been designed individually to complement the installation – the lighting arranged to produce the most spectacular visual effects emanating from the glass, and best appreciate the artistic elements. Some of the most marvelous works, Studio Edition Glass produced at his Portland Press factory, are available for sale in the shop (ranging in price from $4,500-$8,000; seven pieces were sold in the first week the Collection was open), as well as the stunning drawings that reveal Chihuly’s creative process as well as his extraordinary talent in this medium. Dale Chihuly's Studio Edition Glass is available for sale at the Chihuly Collection shop © 2010 Karen Rubin/news-photos-features.com. The Collection is open daily (tickets are for timed entry); docent-led tours are available every half hour on the quarter hour, beginning at 10:15 a.m. (though these were still being put into place when we visited). The Glass Studio & Hot Shop, housed at the Morean Arts Center, provides an opportunity to see working artists in the visually exciting process of creating lass pieces. The artists provide running commentary on the steps they are following, the science behind glass, and the artistic vision guiding the process. You sit in stadium-style seats watching the artist working in front of the furnace (extraordinarily hot, this is not recommended in summer). there are also opportunities to make your own glass piece, working with one of the Morean instructors (Morean Arts Center/Glass Studio & Hotshop, 719 Central Avenue, 727-822-7872, www.moreanartscenter.org, $8/A, $6/Seniors, $5/students and children over 5). The Collection is walking distance of the Renaissance Vinoy Resort & Golf Club (the hotel has a Chihuly chandelier of its own), the Museum of Fine Arts, a multitude of galleries, restaurants and shops, and soon, the Salvador Dali Museum. The Chihuly Collection, 400 Beach Drive, St. Petersburg, Florida, 727-896-4527, www.chihulycollectionstpete.com ($15/A, $13/Seniors, $12/students & children over 5; combination ticket with the glass studio is $20, $16 and $14).